The project establishes links between fiction, desire and reality; between propaganda, fairy tale and private story, showing time as a stable structure that filled with objects of various ideological systems. The project Lion’s Share shows time as a stable structure that filled with objects of various ideological systems, and proposes to make a mental journey from present to past and back. The real stories of families that that adopted the wild animals become the basis for the revision. In the project, an animal becomes a personage, on behalf of which a story is telling. It gives an opportunity to look at reality from another point of view. 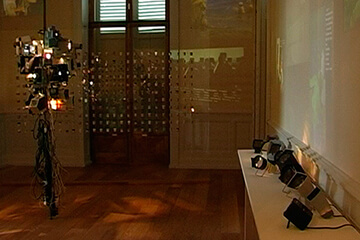 The installation Lion’s Share includes a collection of diapositives and slides produced by the State companies and individuals from the 50s to 2000 as well as actual stories. Installation being based on the intersection of the real facts and fiction provides an opportunity to see in one space the facts that have taken place before, now and after. 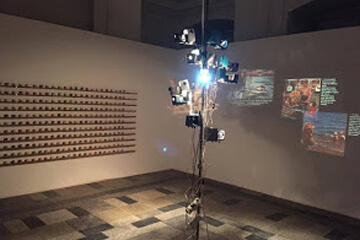 The installation deforms the connection between the objects, images and texts, and provides a sociological analysis of the structure of everyday life.